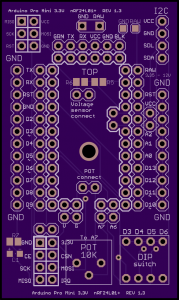 I’ve created a REV 1.3 version of my nRfL01+ board for the arduino pro mini 3.3V. 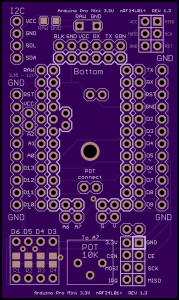 This board still uses the same ports for connecting the nRF24L01+ module as REV 1.2 and 1.2.2. It also has the potentiometer and dip-switches that REV 1.2 and 1.2.2 have. 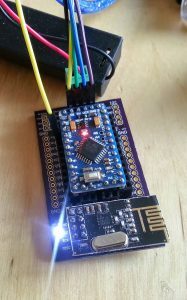 But now there are separate I2C and a SPI connections. And the Raw input voltage can be measured using analog input A6 (as long as it is below 6.6 volts). The brd file can be found here.